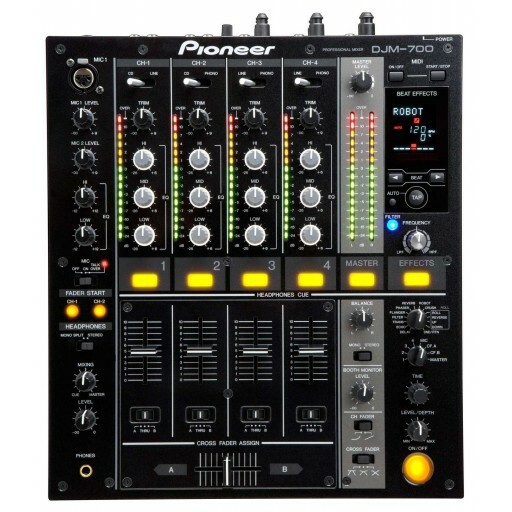 The Pioneer DJM-700 is the world's first mixer to include an Effect Frequency Filter that allows the user to limit the frequency bands subjected to effects. Conventional effectors are limited to manipulating the entire frequency range, whereas the Effect Frequency Filter now expands the user's ability to showcase their own mixing style. The DJM-700 mixer also utilizes the same manual filter found on the well-renowned DJM-800. The manual filter enables more intuitive settings for multi-layered effects expanding the DJs creativity with their music. Combining multi-effect options such as the Beat Effect, along with the manual filter allows for a wider range of DJ style and expression. Beat Effect: Pioneered from the DJM-600, the beat effect has evolved into a 96kHz / 24-bit high performance effect in the DJM-700. The mixer automatically detects the tempo, also known as beats per minute (BPM), of the tune so the effects are aligned perfectly with the beat. The DJM-700 features various effects such as delay, echo, transformer, filter, flanger, phaser, reverb, robot and crush. Roll Sampler: The DJM-700 incorporates a new roll sampler with a 96kHz/24-bit output which allows for real-time sampling of sounds. Four patterns of sampling are available which includes roll, reverse roll, pitch up roll and pitch down roll. Beat Select Buttons: The mixer incorporates two beat select buttons letting the user quickly select the effect timing to add even further control over the effects. DJs with external equipment such as DJ Effectors or DJ software applications that support MIDI control can rely on the DJM-700 to work in unison to create the ultimate DJ experience. 49 of the buttons, knobs and switches on the DJM-700 provide direct MIDI signal output for a variety of control options of external devices.